My Rating: 4/5 stars – Excellent! Why did I read this: I found this series on Goodreads while looking for middle grade boarding school books. The series is not available at very many public libraries, which has prevented me from continuing it past book 2, but I recently purchased books 3 and 4. Canterwood Crest is one of the best Middle Grade series I have read. 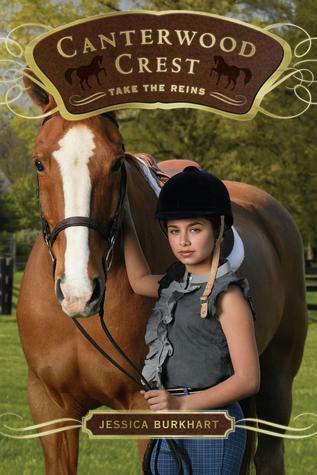 It is about student life at an elite horseback riding boarding school, Canterwood Crest Academy. I think both young people and adults can relate to and draw personal meaning from this very realistic portrayal of a 12-year-old’s life. What makes this series so effective is that it also has a fast-paced and exciting plot, with many twist and turns. 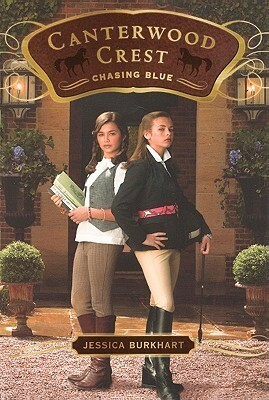 Canterwood Crest book one, Take the Reins, and book two, Chasing Blue, are about Sasha Silver and her horse, Charm. I understand that the books switch to different main characters throughout later volumes. Sasha is an excellent heroine – she is a smart, confident, capable girl who starts at Canterwood Crest Academy at the beginning of Take the Reins. She is used to being the best rider in the stable and the smartest girl in the class. However, at Canterwood, Sasha now finds that she is average and even behind in some areas, which can happen when children change to a better school. I think this is an important learning experience that makes Sasha a more interesting, well-rounded character. In her first year at Canterwood, schoolwork and horseback riding are not as easy for Sasha as before, because she is in a more challenging environment, and this causes a change in her personality: She does poorly in a riding competition, she gets drawn into petty fights with other girls, and she fails tests that she has studied hard for. Sasha pays for her mistakes, but she also learns from them. I think learning from experience will continue to be a theme throughout the series. Sasha’s problems are not clear-cut, or perfectly resolved by the end of the story, rather, her life continues to be messy and her experiences are realistic. For example, Sasha’s friends do not always talk to her openly and completely honestly, she is unsure whether two boys like her, and she doesn’t realize that one of her best friends is mad at her over something she cannot control: that the boy her friend likes has a crush on Sasha. I found it refreshing to read a middle grade or teen story with a flawed heroine, instead of one about the bravest, strongest, or smartest girl. Alongside Sasha’s complex character is Heather Fox, who starts as a “mean girl”, out to get our heroine, but who becomes a real friend to Sasha. The reader starts to see another side to Heather once Sasha actually gets to know her: That she has dreams, that she can be nice, and that she is a strong and loyal teammate. We learn why Heather might lash out towards Sasha and others; because she feels insecure due to the extreme pressure from her father to succeed, because he constantly threatens to pull her out of Canterwood if she doesn’t do well. I found this to be a realistic portrayal of this type of high pressure parent, and Sasha has to learn how to be a friend to a girl who lives under extreme pressure. This story line is treated with care and gives depth to Heather’s character, it is not just there for the sake of adding drama. I highly recommend the Canterwood Crest series to any age or gender! That being said, I find Sasha is a very realistic 14-year-old, because she acts like a 14-year-old, and I would have loved to read these books when I was that age. I still enjoyed this series immensely as a 28-year-old, because the story-telling is very strong, the twists and turns keep you reading, and readers can see themselves in Sasha. Top Ten Tuesday: Why Haven’t I Read More From This Author?